These Herman Miller Resolve 6×6 units are an exceptional option for businesses that are looking for an alternative from the “usual” cubicles units. A nice thing about this unit is that the gradual edges make the Resolve feel very welcoming. The 83 inch boomerang work surface allows ample room for projects. Every unit has two shelves and a marker board. The book shelf is a vibrant red. Integrity Wholesale Furniture is selling these in pods of six. 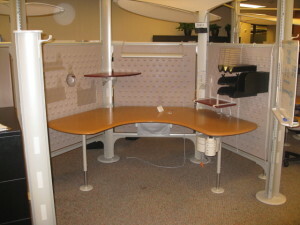 Contact us to find out how your Columbus, Ohio office can get these cubicles for the low cost of $895. No Comments on "Used Resolve Cubicles"